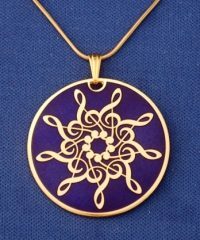 A curved line of gold-plated sterling silver weaves in and out, in and out on its way around this nine-pointed star pendant, creating a look that is both elegant and hand-crafted. This has been one of our most popular designs for years. We have updated it by making it slightly larger (7/8″) and moving the loop for the chain to the back so that the delicate design is not spoiled by a big circle on the top. This creates a “Floating” effect that is very elegant. Also available in sterling silver (JY-8).